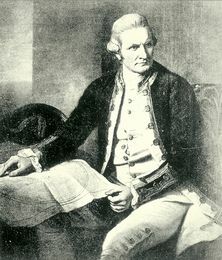 British Captain James Cook arrived in the Islands on his third voyage to the Pacific. Commanding the Resolution and Discovery on a mission to explore a Northwest Passage and to plot the transit of Venus, Cook first sighted the islands of O'ahu, then Kaua'i and Ni'ihau on January 18, 1778. Greeted as a sacred high chief or a god, Cook responded to islanders' hospitality by leaving Hawaiians three goats, two English pigs, and seeds to plant melons, pumpkins, and onions. After naming the Islands after his patron, John Montagu, Fourth Earl of Sandwich, Cook left for northern waters to complete his mission. Returning in November to winter in the Islands, Cook and his ships tacked off the coasts of Maui and Hawai'i for eight weeks before anchoring for an extended stay at Kealakekua Bay. The official account of Cook's voyage published in three volumes appeared in 1784. The popular official publication went through several editions, augmented by numerous pirated versions and translations.